I have mentioned many times before that I find cream products work really well with my dry skin to make it look fresh. The added bonus is that they are very quick to use too! Today I want to share some of my favourites that I reach for regularly. 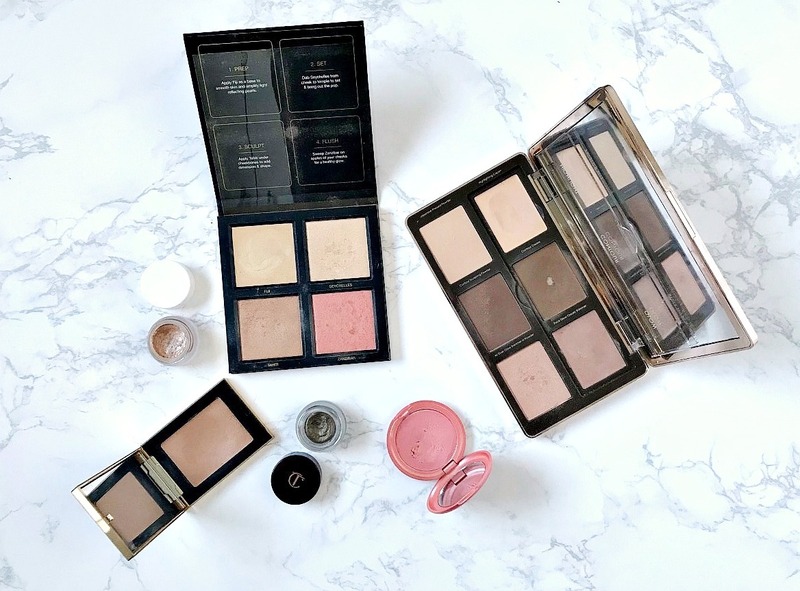 Natasha Denona Sculpt & Glow Palette: There are three cream products and three powders in this palette and my favourite is definitely the cream contour (the powder contour is awful - review here). It is so easy to blend in with either a brush or a beauty sponge and the shade is the perfect balance - not too ashy and not too orange. I don't go for a full on contour, rather some definition and it is s quick and easy to achieve with this cream. YSL Les Sahariennes Cream Bronzer: I adore this (discontinued - sob, sob) bronzer. It looks so natural on the skin, it blurs the appearance of pores and fine lines and it doesn't feel like an extra layer of product. The packaging is stunning and there is nothing not to love (apart from the fact that it has been discontinued). I have been asked how it compares to Chanel Soleil De Tan and I personally prefer the texture of this YSL one and also the blurring abilities. Huda Beauty 3D Highlight Palette: This palette has both a cream and powder highlighter, which layer well together for an intense highlight, but using the cream highlighter alone creates a beautiful sheen to the skin. There is no fear of an unflattering glitter so it would suit all ages plus the texture just melts into the skin. Full review here. Stila Convertible Colour: This can be used on both the lips and cheeks, with cheeks being my personal preference. It's pretty pigmented so I just dab a little on each cheek and blend using either my fingers, a stippling brush or a beauty blender. The result is a very natural flush of colour that makes me look healthier! Charlotte Tilbury Eyes To Mesmerise: I love these cream shadows for a very quick eye look. They're pigmented and easy to blend. Creamy in texture, but once they set, they don't budge! Perfect for when you want to look like you've made an effort without actually doing so! Natasha Denona Chroma Crystal Top Coat: Another cream shadow that can be used alone for a quick look or as a shadow topper as there is a very fine sparkle running through it. A quick sweep will give a wash of colour but they can be layered for more intensity. They are foolproof to use. Do you like to use cream products or are the stuff of nightmares for you? I'd love to hear! All products are bought by me, unless otherwise stated. Please see ASAI rules for bloggers in Ireland here. Opinion is always my own. Affiliate links may be used.